The vibrant Benaud Trio rose to national prominence after winning the Piano Trio prize at the 2005 Australian Chamber Music Competition. The ensemble’s name is a tip of the cap to their shared love for cricket, and their belief that the performance of the most exalted and refined of music can sit quite comfortably with a passion for other expressions of our culture. The Benauds combine the greatest commitment to performing excellence with a sparkling Australian lack of reverence for a po-faced classical-music scene. One of Australia’s best known composers, Ross Edwards has created a unique sound world which seeks to reconnect music with elemental forces and restore such qualities as spontaneity and the impulse to dance. Intensely aware of his vocation he has largely followed his own path, allowing the music to speak for itself. His music, universal in that it is concerned with age-old mysteries surrounding humanity, is at the same time deeply connected to its roots in Australia, whose cultural diversity it celebrates, and from whose natural environment it draws inspiration, notably through birdsong and the mysterious drones of insects. Ross Edwards’ compositions include five symphonies, concertos, orchestral, chamber and vocal music, children’s music, film scores, a chamber opera and music for dance. Works designed for the concert hall sometimes require special lighting, movement, costume and visual accompaniment – notable examples are his Fourth Symphony, Star Chant, premiered at the 2002 Adelaide Festival; the Oboe Concerto Bird Spirit Dreaming, which Diana Doherty premiered with the Sydney Symphony and Lorin Maazel, subsequently performing it with many other orchestras around the world including the New York Philharmonic; and The Heart of Night, for shakuhachi and orchestra, composed especially for the shakuhachi Grand Master Riley Lee and the Melbourne Symphony Orchestra. Edwards’ Piano Trio, dedicated to his wife, Helen, was commissioned by the Melbourne International Chamber Music Competition in 1998 as a test piece for competing ensembles. The texture of the first movement is clear, open and transparent. The composer had in mind the image of sunlight sparkling on the Arafura Sea. The meditative second movement transports the listener to another realm with intimate dialogue between the violin and 'cello over a chorale-like accompaniment in the piano. The movement concludes with a brief quotation from Edwards’ own Second Symphony. The third movement Allegro assai bursts suddenly from the remains of the slow movement. With relentless energy and rhythmic activity, this movement is typical of Ross Edwards’ Maninyas style where the music’s shapes and patterns have their origin in the natural world. ‘I was drawn to Monteverdi’s madrigal ‘Dolcissimo Uscignolo’ not only because of its heartbreakingly beautiful melody and luminous harmonic style, but because of its textual playfulness about the nature of song. In this madrigal, the poet reflects on the beauty of the nightingale’s song, its joy and freedom in flight. This is contrasted with the earthbound misery of the poet who says he has no use of singing. Cantando vieni, vieni anima mia. E non ho come tu da volar ale. Se ti negò saper, ti diè ventura. And I have no wings like you with which to fly. Denying you understanding, she gave you joy. ‘Of course, the idea of a song about having no use for song seemed deliciously ironic and ripe for deconstruction, especially in an instrumental piece where there is no literal singing going on at all! ‘Fragments of the madrigal are heard throughout this single-movement Trio somewhat in the manner of half-recalled memories, forming the basis for much of the motivic material in the piece. As a result, the piece is quite melodic in its range, even though a range of expressive instrumental devices are used, ranging from overtly tonal material, through to more jagged, spiky textures. ‘This trio takes on a broad arch-like shape, in that the slow and reflective music of the opening and closing acts is like an outer frame to a long central section which is fast, dance-like and exuberant. Here the piano has the role of maintaining much of the rhythmic momentum. Throughout this central section more fragments are introduced in a series of conjoined episodes, exploring a multiplicity of instrumental techniques and combinations of sounds. Matthew Hindson (b. 1968) is one of Australia’s most exciting composers. He studied composition at the University of Sydney and at the University of Melbourne with composers including Peter Sculthorpe, Eric Gross, Brenton Broadstock and Ross Edwards. Hindson's works have been performed by ensembles and orchestras throughout his native Australia, including most of its professional symphony orchestras and chamber groups. His music often displays influences of popular music styles within a classical music context, and as a result, musical elements such as driving repeated rhythms and loud dynamic levels are typically found in his works. Indeed, directness and immediacy are common features in the much of his music. Hindson’s Piano Trio (2007) is no exception. The work opens with a spirited, very fast movement that is scherzo-like in most of its character: light, airy and playfully rhythmic. It is written as a Moto Perpetuo, i.e. it doesn’t really stop from start to finish. It does slow down in places…but quickly speeds up again. In contrast, the second movement, entitled ‘Repetitions’, is much more lyrical in content. This movement explores melodic ideas placed upon a repeated chord progression from start to finish. The chords themselves are reminiscent of those found in the trance music genre. The final movement, ‘Epic Diva’, takes its title from the genre of singing commonly found in anthemic electronic-based dance music. Much of the musical content in this movement is similarly derived from contemporary dance music genres, especially repetitious chord progressions and the style of piano writing. It is very much an upbeat movement, full of energy and vitality. This piece was funded with the assistance of the Australia Council, the Federal Government’s arts funding and advisory body. It was premiered by James Cuddeford, Stephen Emmerson and Trish O’Brien at the Camden Haven Festival in Kendall, NSW on 21 April 2007. 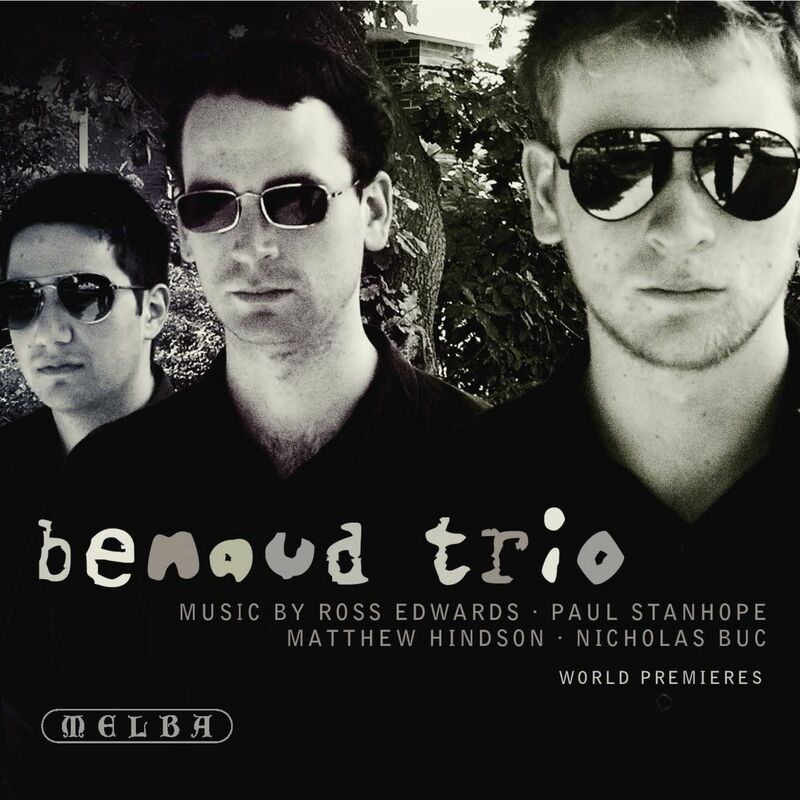 Trailer Music (2010) is a concert showpiece for piano trio, commissioned by the Benaud Trio. Whilst the title takes its inspiration from the pre-film advertisements regularly seen at the cinemas, the music is more than just a two-minute thrill ride through lavish vistas and explosive special effects. The score covers a range of emotions, designed to lead the listener on a journey through turbulent action set pieces, sinewy psychological dramas, quirky character stories, innocent romances, and magical wonderment. Composer Nicholas Buc (b.1982) is establishing a formidable reputation across a wide range of musical genres. His work includes everything from major choral commissions, music for TV and film to popular music arrangements.